Do you like French Burnt Peauts? "These French burnt peanuts (also known as candy peanuts) used to be sold by the scoopful at the corner candy store, but now they are a bit harder to find. Delicious, fresh Spanish peanuts, covered in a crunchy candy shell. A favorite of dads and grandpa's everywhere! 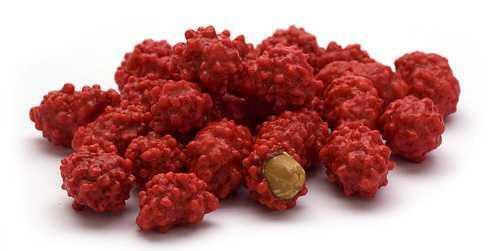 These prickly sweet and slightly salty candy coated peanuts are an old-time favorite." I'll eat them if they're around and it's something to snack on. Never heard of 'em but they sound delicious - as long as the peanuts aren't bitter. Sometimes (for example, chocolate covered) roasted peanuts taste slightly bitter and I suspect it's because they've been cooked for too long. Occasionally you'll get one that's a little bitter because it's extra roasted. I'm not sure why they said fresh because they taste like they have to be roasted. They sell them under the brand name Boston Baked Beans in the US. Never much cared for them. Unless you're in the bulk section, haha, that's where mine are from. I'm in the US. I've had both good and bad versions of these. I Never had them but they sound like they taste good. What are your favorite go to sweets? Do you like fettuccine Alfredo? If you drink, what drink do you usually order? What was in this girls drink? Which You Pickin 類? I like Boston Baked Beans better. Boston Baked Beans candy is similar in taste to the French Burnt Peanuts with the exception to the texture. One is smooth and the other is rough coated. No, but I love Spanish peanuts. I had to stop eating them because I found I have a really mild allergy to peanuts. As in The Legend of Zelda? I have not had them yet, but they sound good. Loved them, but haven't had them in a long time. Mmm, I'd love to find them. I've had those before and they are delicious. Home > Food & Beverage > Do you like French Burnt Peauts?